Since watching the Great British Bake Off, I've been meaning to have another go at making shortcrust pastry. It's not that I haven't made it before, but it seems to be a bit hit and miss when I do and recently I've been cheating and using ready made, but still feeling rather dissatisfied with the results. 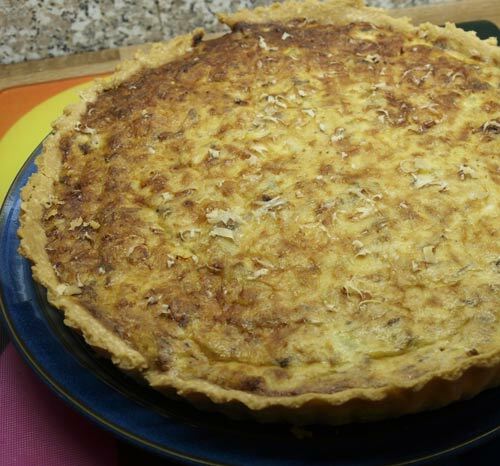 We had a glut of eggs, as DH gets 6 every week from someone at his work who keeps hens, so I thought that I would make some kind of a 'quiche'. I had some peppered smoked mackerel in the fridge and some greek yogurt. I was sure I had a recipe somewhere for Smoked Mackerel Quiche but couldn't find it anywhere, so this is a bit of a hybrid recipe. Sift the flour into a bowl and rub in the butter until the mixture resembles fine breadcrumbs. Stir in the salt or caster sugar, then mix to a dough with the egg yokes and a little cold water if necessary. Wrap in clingfilm and leave to rest in the fridge for 20-30 minutes. Roll out on a lightly floured work surface and use to line a deep 28cm/11 inch loose-bottomed flan tin. To bake blind, cover the pastry with greaseproof paper and fill with baking beans (either ceramic ones or any raw dried beans, which you can reuse for baking blind). Remove the beans and greaseproof paper and return the pastry case to the oven for 5-10 minutes, until very lightly coloured. After removing the beans and paper you could brush the partly cooked pastry with lightly beaten egg white before returning it to the oven. This helps to form a seal and keeps the pastry crisp when you add the filling. Flake the fish from the skin and break up in a bowl. In another bowl beat together 3 whole eggs and two egg yolks then add the yogurt and mix well, add the mackerel and the gherkins to the egg mix and put the mixture into the pastry shell. Yes, well I had some salad leaves but when I went to look, there were no tomatoes or cucumber to make a salad, so I had to improvise. 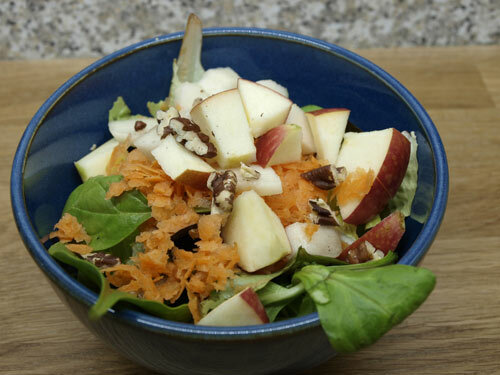 place the salad leaves in a bowl or on a plate, add some grated carrot, chopped pear and apple and scatter over some chopped pecan nuts. I have to say that is was much nicer than it would have been if I had had some tomatoes, which just goes to show that I am getting into a cooking rut, very much evidenced by my lack of blogging . Well timed, Janice... the Bear just asked me to make a quiche and when I asked him what sort he just shrugged and said, "You decide"
:-) You'd think if he knew he wanted quiche he'd know what he wanted in it. And then, of course, I couldn't think what sort to cook!Great idea... thanks! 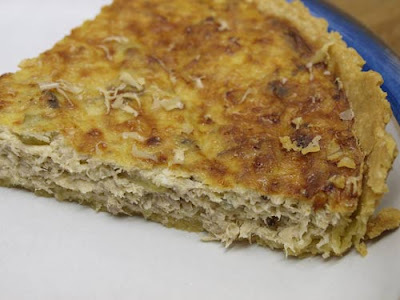 Greek yoghurt is great in a quiche - have never used smoked mackerel though. Will try that. One of my fave easy recipes is Smoked mackerel, mashed up with cream cheese, touch of lemon juice or zest and a touch of horseradish, a little bit of yoghurt or creme fraiche added to loosen it up - delicious, easy pate! Thanks for your kind words on my blog - feel a bit emotional about it all!